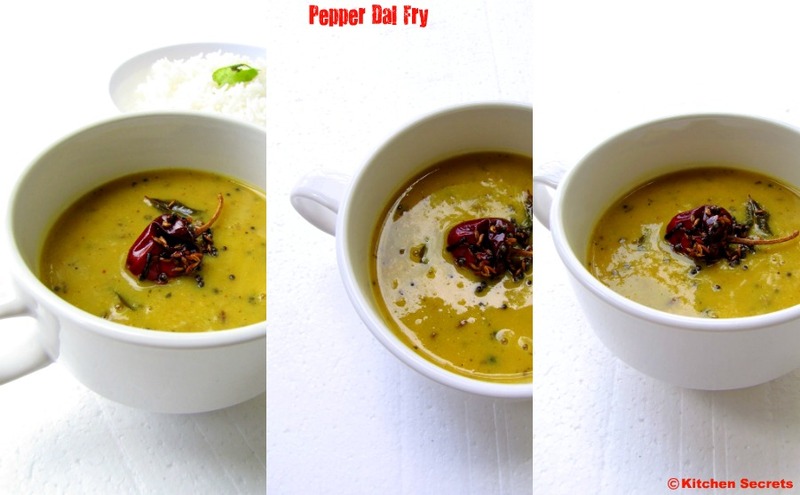 Pepper dal fry is an easy breezy curry but tastewise delicious. This will often find an place in our thali on saturdays esp. in my mom's house. So, the source is my Mom. The addition of pepper give some nutty bold flavour and enhance as well. I happen to have this kinda fry whenever I feel sick, means, cold, cough even fever though..Since it has garlic and ginger too.. Moreover , I get bored of eating rasam and so what I would do is ,just include few drops of tamarind juice while making this curry.. Trust me, thatz def. a change in my meal and thatz how I play with the food during needy times. Pressure cook the dal with green chilly,pepper ,turmeric powder and garlic for 3 whistles else until the dal falls flat. Blend the cooked dhal mixture and add little bit of water if real thick. Heat a tsp of oil/ghee and do the tadka with the mustard seeds, cumin seeds, hing, dry red chillies and curry leaves. Finally add the crushed ginger piece and saute well. In the meantime heat the dal adding enough salt and add the tadka once it comes to a rapid boil . Combine well. Switch off and serve with hot steaming rice with ghee drizzled on top. Pepper dal fry looks awesome delicious. Love this comfort food. looks delish- hearty n comforting ! Ahh comforting soul food ~ loved the shots! 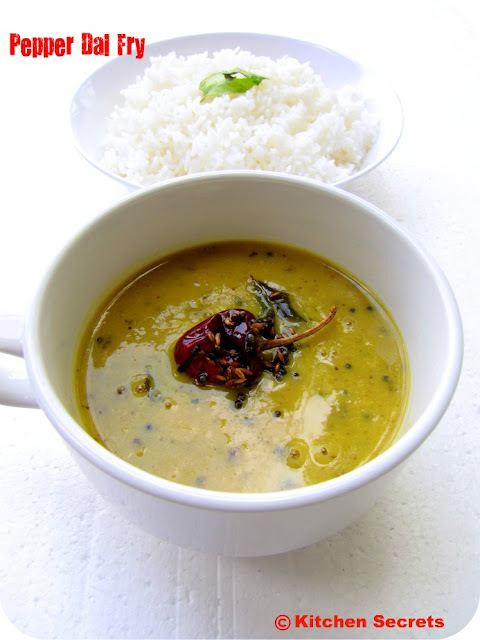 I do this quite often, whether we are sick or not its quite a comforting dal for us and we love it very much..
Yum, simple and lovely !!! Dal fry is a very common item in my menu but never thought of adding pepper in it.. looks delicious.. Comfort food,tempting and perfect with rice. So comfort food !! love to have with rotis !! simple n healthy dal! !nice click! hmmmm..adding pepper is sure interesting, would love to try this one, nice pics. Comforting and yummy dal.Love it hot with rice. great comfort food and amazing clicks. Such a comfort food and your pictures are so calming! so flavorful and yummy Dal!! This is what i wanna have now with some rice...yumm!! Its a comforting dish with hot ghee and rice. Love the pepper flavour. Looks super warm and comforting.. never tried adding pepper to dhal.. wanna try soon..
We make a similar preparation called Miriyala Pappu.. yours looks simply perfect and tempting..